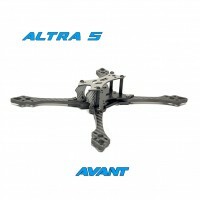 The New Avant Kraken 5 is our latest modular frame design which is compatible with 2 different configurations (Stretched X and Hybrid X). Fits any type of micro sized camera with 19mm mounting pattern and the supplied 3d printed TPU camera mount which allows the camera to be adjustable for better protection. 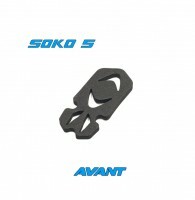 The arms has the same interlocking design as our Altra 5 and it features 5mm thick arm, 2mm mid, 2.5mm bottom plate and 2mm top plate. 30.5mm x 30.5mm and 20mm x 20mm (M3 holes) Flight Stack mounting pattern which allows for different setup. The bottom plate is secured with 4 countersunk screws to help prevent damaging the lipo in crashes. 2.5mm or 3mm thick bottom plate can be chosen for your preference. Air frame weighs 68g with TPU camera mount. Click the button below to add the Kraken 5 Frame Kit "NEW" to your wish list.